If you've eaten at the monastery at St. Scholastica in the past year, you've probably already tasted what's growing on the roof of the Science Building. Mint, basil, lettuce, tomatoes, kale. 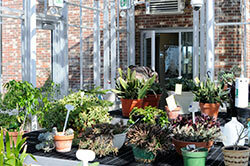 For the past two years, greenhouse manager and biology instructor Jane Wattrus has been growing these and other plants in the greenhouse and growing space on the roof, and using the edible plants to feed the CSS community. "I love it. It's a really nice part of my job," Wattrus said. 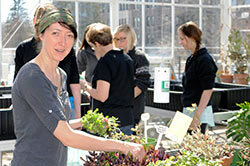 "I love harvesting the food and taking it to someone that's happy to get it. It just feels good." 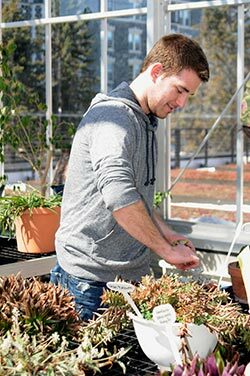 After listening to a talk by former professional basketball player and urban farming advocate Will Allen while the Science Building was being renovated a few years ago, Wattrus had the inspiration to start growing at CSS. 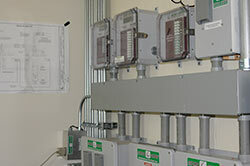 "This is the way of the future," Wattrus said. "We have to use every place we have to grow food." So with the help of a grant from the Duluth Superior Area Community Foundation and Burlington Northern Santa Fe, CSS became one of the first schools in the region to turn its roof green. A greenhouse was built — with fully automated temperature control — to grow plants when the climate is unsuitable — along with a "green roof" outside where they are moved when the weather improves. This roof is covered with rocks and permeable concrete-like panels that enable the rooftop plants to be watered. "A lot of people wonder if a green roof would function in Duluth," Wattrus said. "But why not? People have been growing food here long before we had grocery stores. There's no reason why we can't." 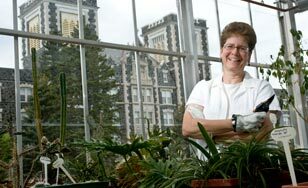 In Wattrus' plant systematics class, students have the opportunity to actually take fern spores, sow them, and grow their own "baby" fern plants in the greenhouse. "It was an amazing practical application of what we know," said Amy Blakeslee ‘15, a former student in the class. "Most of us are biology majors, so we know a lot of this in theory, but not in practice. So to actually be a part of that biological process was really fascinating." 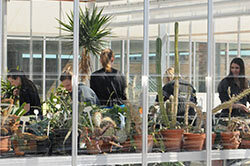 Other science classes use the greenhouse and the plants in it for similar hands-on experiences. But the lesson they all have in common comes back to the school's Benedictine values. "Sometimes it is kind of baffling as to how to actually be a good steward," Blakeslee said. "This is a great example of how to practically contribute to our environment and come up with some solutions that are out of the box." And it comes with a few perks. "There's nothing like a fresh cherry tomato in January," Blakeslee said.